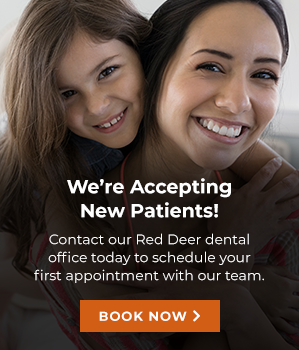 Meet Dr. Tristen Aull and Dr. Scott Matheson - your dentists at Southpointe Dental in Red Deer. As a practitioner of medical dentistry, Dr. Aull prides himself on taking the time to listen to his patients' concerns so that he is able to best understand their unique needs. From baby's first checkup to replacing grandpa's missing teeth, Tristen strives to make every visit as comfortable, relaxing, enlightening as fast as possible without sacrificing great, long-term results. Originally from Calgary, Dr. Aull attended the University of Victoria for his undergraduate degree, majoring in cell biology. During that time, he volunteered at the Cool Aid Society, a reduced-fee dental clinic serving Vitoria's needy. Upon completing his B.Sc. he moved to Vancouver to work toward his dental degree at the University of British Columbia. After wedding his longtime love, Donna, Tristen was happy to return to his home province with his new bride in tow. Together, they look forward to exploring Alberta's many amenities, such as golfing, cycling and hosting family BBQs. Give yourself a reason to smile - schedule your appointment today with one of our dentists here at Southpointe Dental! Dr. Scott Matheson originally hails from Golden, BC where he spent his formative years either outdoors taking advantage of the mountains or playing competitive sports including golf, soccer, and hockey - he even had a couple teeth knocked out in the process and spent his fair share of time in the dental chair! After leaving home to play junior hockey and travel the world, he pursued a Bachelor of Science degree at Thompson Rivers University, majoring in chemical biology in 2007. During his undergrad, he was privileged enough to work for the government researching topics including the taste and aroma of wine. Furthermore, his year senior honours project on "Oral antimicrobial peptides with applications in oral health" was published in the International Journal of Biology. It was a natural transition to dentistry from there, while he pursued a Doctor of Dental Medicine (DMD) at the University of British Columbia, graduating with multiple recognitions. After graduating, Dr. Scott moved to Alberta and settled in Sylvan Lake in a home he shares with his rambunctious Golden Retriever, Luna. He has been with Southpointe Dental ever since. Dr. Scott practices in all areas of general dentistry and looks forward to helping you and your family have healthy, beautiful smiles.